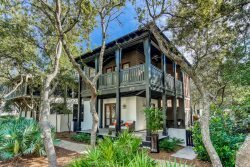 South Walton Luxury Home + Carriage House in Watercolor near Lake, Beach Club + Town Center! 30A Escapes presents... "12 Blue Stem"
This house is located in Phase III bordering the state forest. If you like the quiet while at home, yet want to be close to all the action, this is the best located house in WaterColor ! There is very little traffic and a quiet street for kids to ride bikes and play on. The lake and walking paths are accessed at the end of the block. We have a fantastic third for loft for the kids to slumber and play in. A great porch for the parents to relax and even catch a game on the outdoor television. This residence is on the north side of Western Lake on the corner of Cove Hollow and Blue Stem Lane it is less than a five minute bike ride across the lake to the Beach Club. Walk just two full blocks down the street and you are crossing the bridge to Town Center. It is also just two blocks away from the Phase III 'frog' pool. Professionally decorated at a standard well above a typical rental. One guest has described it as having a contemporary beach loft feel. This home is for the guest that desires, appreciates, and will take good care of a 'step above' rental. Please see the comments in our guestbook. Many guests have said it has the best layout and nicest decor of any house they've stayed at in Watercolor. Enjoy the top of the line Wolf range and Sub-Zero fridge, ice maker, and wine cooler. Weekend chefs will enjoy the All-Clad cookware. Spices and condiments are kept on site for all to share. Original art from the owners personal collection adorn the walls. Enjoy the canvases of local artist Justin Gaffrey, the 'Cuban Picasso' Jose Fuster, and Cubist- Almer. Dine on the porch or enjoy the fantastic patio overlooking the forest. Use the outdoor kitchen, fireplace, and dine under the stars to complete a perfect day at WaterColor. Multiple porches and floors allow each person the freedom to get away from the multiple family- vacation circus when needed! Three bedrooms and third floor 'bunk/play room' in main house. There is a bedroom with full living room and kitchen in the carriage house. Unique for WaterColor, the carriage house has a full size porch. The four single bed bunk room is a great place for kids to sleep, play, and simply be 'lost'. They can be two floors away without getting into trouble and the adults get their peace and quiet. King size beds in the master and carriage house. Queens in the two guest bedrooms. Four singles and a TV area in the third floor loft.